In 1986 I first learned a little about Papua New Guinea (PNG) from my forest harvesting lecturer, at the University of Aberdeen. At that time the rate of forest exploitation in PNG was rapidly increasing. Industrial scale logging had been initiated prior to independence in 1975 by the colonial administration who were concerned about how the country would become economically sustainable after independence. As a consequence a project was established to clear fell 73,000 ha of rainforest in the Gogol Valley in Madang Province for pulp. The project was taken up by JANT, a Japanese pulp company in the early 1970s, after purchasing the logging rights. The colonial administration put some thought into the proposal and planned for the cleared land to be used for rice farming, cattle production and reforestation with fast growing acacia plantations (Lamb, 1990). Only a few thousand hectares of plantation were established and the planned agriculture never eventuated. A decade later I was on a site visit in the Gogol Valley with students from the Department of Forestry at the PNG University of Technology. I had taken up a lectureship position for three years. I landed in PNG in early 1997 for the first time. A week later my colleagues in the Department of Forestry asked if I wanted to join them for some protest activities. Earlier in the day students had requested that I leave my office to support the protest. The Sandline affair was in full swing. It was to be an eventful few days with adjacent businesses firebombed, battles against the police and daily automatic gunfire. The confrontation looked serious to the outside world. Students displayed lines of Molotov cocktails ready for use. After a standoff for three days at the university entrance the police had had enough of their tear gas blowing back in their faces, and charged the university campus with automatic weapons firing. Many of the expatriate staff were taking afternoon tea and watched in amazement as running battles traversed the football oval. The following day everyone went back to work and daily life went on as if nothing had ever happened. It was as if the past three tumultuous days had been a carnival. This I was quick to learn was normal life in PNG, volatile and outraged one moment but peaceful the next. The riots were a protest against the Government, which under the leadership of Julius Chan was attempting to bring in South African mercenaries under the command of the former British army officer Time Spicer, to resolve the conflict on the island of Bougainville. The aim was to neutralize the Bougainville revolutionary army who wanted independence from mainland PNG, and to reopen the enormous Panguna copper mine. The Sandline affair took PNG to the verge of military revolt and ended with the PM’s resignation. Although unrelated to forestry this eventful introduction to life in PNG was an uncompromising lesson on the value of resources in PNG and how their ownership is fiercely defended because of the enormous financial gains that are potentially available. After three years living in PNG I moved to Australia and now regularly travel to PNG as a consultant where I am typically based in remote areas undertaking a variety of forest survey activities, in collaboration with my local team and landowners. Occasionally we travel to logging camps and meet with the predominantly foreign owned logging companies, often in their remote log yards but occasionally in their logging palaces. Visit the Vanimo Timbers Forest Products head office in Vanimo in West Sepik Province and you may get to walk across the marble like floors and admire the Chinese dragon murals on the wall. It is an imposing building, adjacent to the log yard. Vanimo Forest Products was originally owned by the Bunning Brothers Group from Australia who started logging in 1986, but the company was taken over by a Malaysian company in 1990. Working in PNG is full of surprises and challenges. The county’s landscape is dominated by a rugged central mountain range that rises to 4500 m above vast flood plains, which lead to some of the world’s largest remaining intact tracts of mangroves in the Kikori and Fly River deltas. Huge rivers drain the central mountain ranges, with some of the most famous being the Sepik River, the Fly River and the Kikori River. 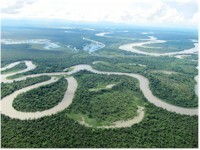 Fly over PNG and you will get the impression that it is a vast tropical wilderness of frontier forests. Don’t be deceived by the verdant green below. For those not familiar with PNG a quick internet search will provide endless web pages of resource conflicts where landholders are pitched against the PNG Forest Authority (PNGFA), government and the Malaysian owned logging companies. It is hard to find consensus about the real situation as it depends on whether you believe the NGOs, the Forest Industry Association (FIA) and the private economic think tanks that support their claims. What you will rarely find is comment by a logging company. They are too busy unless stopped by an NGO driven logging moratorium or court injunction. PNG has a land area of approximately 46,410,00 ha, of which 60 - 70 % of the land area is still natural forest which includes some large areas of logged over forest. The population of seven million comprises enormous cultural and linguistic diversity, with past isolation of communities in remote valleys resulting in the development of over 800 distinct languages. Most of these tribal groups developed livelihoods dependant on forest resources, and for 80 % of the population this is still as important today. The forests are still essential for supplies of firewood, house building materials, medicinal plants, and hunting for bush meat. Although essential for livelihoods for much of the population, the forests have also been essential for the development of the country, particularly prior to the current mining boom, by providing significant government revenues from industrial logging. Conventional industrial scale harvesting of PNG’s native forests was implemented by selective logging of concessions on a large scale and high intensity prior to independence in the 1970’s. After independence in 1975, the number of concessions began to gradually rise, with operations occurring in most provinces by 1985. Much of the early exploitation focused on the Islands Region (e.g. New Ireland and New Britain) where commercial volumes were higher on the more fertile volcanic soils, and access and timber export was relatively simple through the construction of basic logging roads and wharf facilities. By 1992 the majority of concessions on the Islands region had been designated and the industry switched its attention to the mainland’s less productive forest (lower commercial volumes) with lower stocking densities. The continued expansion of logging across PNG was and still is promoted as a sustainable way of generating significant government revenue, which currently brings in PNGK (kina) 120 million per annum from logging royalties and timber export tax. Logging benefits have provided a mechanism for isolated and undeveloped rural communities to gain benefits over the life of a logging project, where there are few if any substantial economic alternatives. Resource owners receive community benefits managed by their representative Incorporated Land Owner Group (ILG) to ensure benefits, in theory, are equitably distributed. Benefits include royalties, annual benefits fund and infrastructure development. However royalties to landowners were set at an appallingly low rate of PNGK 10 per cubic metre until 2008 when it rose to PGK 30.00 ($11) per cubic metre. Many argue that the benefits received do not reflect the value of the resource, and the wider damage to the environment. Forestry in PNG should have performed better by now, but even today after 40 years of rainforest logging as opposed to well managed forestry, the industry is still plagued by poor governance, endless accounts of contractual breeches by the logging companies and almost no real delivery of infrastructure benefits to landowners. Although some isolated village community representatives have received large royalty payments, reflecting the enormous sizes of their forest resources, the transition from subsistence to wealthy landowner overnight has been difficult for landowners not used to financial management. There are endless accounts of the elected community representatives squandering royalties in Port Moresby, the capital city, with little improvement in life for those back in the village. I have travelled to many villages that have had their resources logged, and sadly there is little evidence of long term improvements for most. In 2007 I interviewed a remote community in Western Province and asked them what they would like in the way of the infrastructure if the proposed logging project went ahead. I was involved as an independent consultant to provide feedback to an investment company. If the project went ahead one of the village leaders was adamant that a small office block should be constructed so that the community could have a lift for people to ride in! The village leader had visited Port Moresby once and had experienced a lift so wanted one for his village. Unusual and sometimes unrealistic expectations are characteristic of the benefits remote communities hope to be provided with from development activities such as logging. Earlier in the day we had been walking through some of the project areas forest in quite steep terrain with the project’s developer, an Australian. Despite the remote location he struggled through the forest carrying a heavy briefcase in his hand. Whether this behavior reflected the influence of the heat and humidity or reflected the value of the briefcase contents remains unknown. The day was finished with a meal of cassowary stew and wild pig and the handing out of bottles of perfume to some of the local women who had lost their husbands to infectious tropical disease. This may seem an unusual event to some but in PNG it is not. To some extent I was impressed by the developer, he was trying to make a special effort even if it seemed eccentric and trite, but I am yet to confirm whether a thatched lift has been installed in the village. The more serious side of infrastructure benefits involves the development of all weather roads where previously there were no means of transport (other than by on foot or by canoe), and the construction of schools and aid posts. For most projects these benefits are regarded as having not met expectations. The new roads built by the logging companies rapidly degenerate and become almost impassable, the shacks built by the logging company as aid posts or schools have long since passed through the digestive systems of termites. Development is short lived for most rural communities that have signed a Forest Management Agreement (FMA). 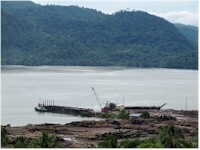 The problems associated with industrial logging in PNG were first highlighted by the Barnett Inquiry in 1987 which claimed that the logging industry was “out of control”. Since then the same issues have arisen almost on a yearly basis. I have lost account of the number of reports that contain identical findings. The issues have been thoroughly researched and reported on by the UK’s International Institute of Environment and Development, and in 2004 the World Bank’s produced a major report for the PNG government, highlighting serious problems. In addition, the NGO the Eco-Forestry Forum (EFF) produces regular bulletins reporting on endless breaches of the logging code of practice by the logging companies, and presents ongoing allegations of ministerial breaches of the Forestry Act in how resources are allocated to logging companies. In response to the Barnett Inquiry, the Government developed and adopted a new forest policy (National Forest Policy 1991), and introduced new legislation to implement the policy. Concurrently Government and donors agreed on the National Forestry and Conservation Action Plan (NFCAP) under which donors provided significant support for the sector in terms of institutional strengthening (mainly to PNGFA and DEC), training (Government institutions and industry), and infrastructure (education, forestry field housing, vehicles and equipment). A key objective of NFCAP was to place timber production on a sustainable basis. However the NFCAP failed to deliver. One of the most outrageous projects that highlighted the failure of the NFCAP was the Kiunga-Aimbak road line clearance logging project. The project was issued with a Timber Authority permit for road line logging up to 1 km from the road centre line in 1995. The project was eventually halted for multiple breaches of the 1991 National Forest Policy and failure to provide reasonable benefits to the resource owners . The project resulted in a 195 kilometer long unsurfaced road that was pushed through by the logging company Concord Pacific. 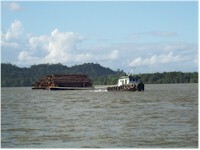 The project was the subject of numerous claims purporting widespread corruption, deception of landowners, withholding of royalties, exceeding of Ministerial powers, illegality of logging, environmental degradation and failure to properly apply the relevant sections of the PNG Logging Code of Practice (PNGLCP) and the PNG Environment Act (Melick, 2003). In some instances the Kiunga Aimbak project logged over 10 km from the centre line rather than the permitted 1 km. The project was meant to join remote villages to the small township of Kiunga which has services not available in remote areas. The road line did not reach its destination. Ultimately the projects poor performance reflected weak governance in the PNG forestry sector. 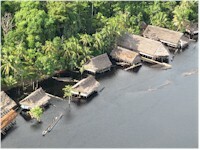 The PNG Forest Authority and the PNG Forest Industries Association have made presentations to the independent policy think tank Chatham House in the UK, stating that there is no illegal logging in PNG because logging companies follow the relevant laws, but they do admit there are compliance issues (Iko-forestri, 2010). The legality of a logging operation is a moot point when major breeches in the logging code of practice are repeatedly reported. Enforcement of compliance with PNGs relatively strong environmental laws which includes the Forestry Act and Logging Code of Practice has always been a major issue. A logging concession of several hundreds of thousands of hectares will typically only have one designated monitoring officer, who will often have to be supported by the logging company for accommodation and meals. It is inevitable that breeches in practices are overlooked. The poor reputation of the logging industry has resulted in the Australian Government drafting an Illegal Logging Prohibition Bill that resulted in submissions by the PNG FIA to defend the PNG logging industry. Australia is the largest importer of sawn wood from PNG, however banning imports from PNG would have negligible effect given that most of the timber is exported in log form to China and a lesser extent to Vietnam. What is clearly needed is substantial and long term capacity building in the forestry sector. Australia, through its aid agency AUSAID was engaged with the forestry sector in the late 90’s but little has been done little since. The Forestry Research Institute in Lae is in terrible condition with few scientific publications produced over the last 15 years. Moreover the forestry degree course was subject to a damaging review by international educators in the late 1990s, which reduced an emphasis on forest botany so that now many forest graduates lack the ability to identify many of the common commercial species. This skill is fundamental to working as a forester in PNG. While these concerns remain unaddressed and forestry capacity dwindles in PNG the logging industry has grasped a new opportunity for a resource grab. Over the last few years there has been a rush by logging companies to gain Special Agriculture and Business Leases (SABLs) that allow forest to be cleared under the condition that the land is converted to productive agriculture. According to Greenpeace, since 2003 the PNG Department of Lands and Physical Planning has approved 74 SABLs covering about 5.2 million ha of forested customary land. This area is 11% of PNG’s total land area or about 18% of its remaining forest. Although this statistic is hard to believe given that the approximately 30 forest logging concessions currently in production, operate over an area of only 3 - 4 million ha. The leases can run for 99 years and potentially alienate customary owners who can only remain on their land at the discretion of the leaseholder. The push for these leases has been driven by the lack of new logging concessions (FMAs). It has been many years since the PNG Forest Authority has approved an FMA or an extension to an FMA. Consequently logging companies apply for an SABL to short cut the process. The fact that there is little or no reported agricultural activity in most cleared SABLs suggests that the SABL’s are clearly being abused. Most SABL’s are applied for to convert natural forest to oil palm. Unless an SABL is near existing plantations this is clearly an abuse. To run a profitable oil palm plantation in PNG requires at least 10,000 ha of land which must be located near a port and within 24 hours transport of a processing plant. A minimum investment of PGK 230 million is required to establish the required infrastructure and processing mill. Where blocks of land have been proposed to be cleared in potentially suitable locations there are endless claims that clearance progresses without informed consent. The situation resulted in the UN High Commission for Human Rights (UNHCHR) sending an early warning letter to PNG’s UN Ambassador expressing concerns over SABLs, particularly in relation to landowners rights and potential alienation of their land. As a result in 2011 a moratorium on the issuing of SABL’s was granted and an inquiry was set up. It is a controversial issue for the PNG Government since some politicians are associated with several of the SABL applications, but the main applicants are the Malaysian owned logging companies. Sustainable forestry has an important role to play in PNG, providing income for remote village communities, employment and government revenues. However government revenues from logging will be dwarfed by revenues from the soon to be finished PNG Liquefied Natural Gas Project which will export natural gas reserves from the Southern Highlands of PNG. Revenues from this project will be billons of Kina. Similarly the proposed Wafi gold mine in Morobe Province, which contains some of the largest known deposits of gold will eventually add significantly to government revenues. This provides an opportunity to rethink the benefits of the logging industry, and consider whose needs it is really serving. There will be the opportunity to bring good governance to the industry and to properly manage the forests, if there is the will. Despite the gloomy picture forestry in PNG presents the country still has a huge area of forest, and even those forests clear felled have an enormous regenerative capacity if the soil seed bank remains intact. This I have observed throughout PNG, provided fire is excluded. It is hard to predict the future of PNGs forests. Extensive degradation is probably more of a threat than large scale forest clearance, particularly with a rapid rise in the population and increased access to remote forests from industrial developments. With an increased population I suspect that in the next El Nino climatic perturbation large areas of forest will be lost to fire in the highland provinces where extensive untouched tracts of montane forests occur. This happened extensively in the 1997/1998 El Nino event. In addition those areas free from loggers are increasingly subject to interest from the mining, oil and gas industries. Although these industries worst impacts are normally relatively small in area the associated infrastructure can spread for hundreds of kilometres allowing population migration and potentially extensive degradation of previously remote forest wilderness areas. The PNG LNG project in constructing over 300 km of roads from the coastal plains of Gulf Province to the high mountains of the Southern Highlands. This infrastructure is opening up huge forest wilderness areas where the tentacles of forest degradation will spread. As a final note, in 2011 I was based in a remote oil camp in PNG, travelling by helicopter most days to distant forests to benchmark the forest condition prior to potential impacts from industrial development. One morning we awoke to the noise of the lock down siren. No movement was allowed outside of the camp. A fleet of helicopters were ferrying terrified staff from a camp downstream to our camp. The camp had been attached by over a 100 locals armed with bush knives and bows and arrows. The police, having run out of ammunition and tear gas had retreated and left the camp unprotected despite a large number of expatriate staff. The camp was ransacked overnight. I sighed at the news, since for me it was just an inconvenience that meant more boredom in lockdown. I knew it was more about showing who owns the land than an intention to harm. The landowners were simply aggrieved and were expressing their displeasure. 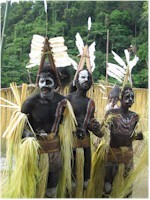 No expatriates were hurt and nor was the intention to hurt anyone, but it was unfortunately a typical PNG event. The large international companies working in PNG are making the same mistake as those 20 years earlier. Always remember who owns the land, the forests and the mineral resources in PNG and engage with them thoroughly to ensure equitable benefits. If not I hope you can run fast! Barnett Forest Industry Inquiry 1987. Report of the Commission of Inquiry into Aspects of the Forest Industry, Boroko, Papua New Guinea. Unpublished report. (Iko-forestri Nius, 2010). The Quarterly Eco-Forestry Newsletter for Papua New Guinea. Voume 13, Issue 1. Lamb, D. 2011. Regreening the Bare Hills. Tropical Forest Restoration in the Asia-Pacific Region. Springer. Guavi area, Western Province, Papua New Guinea, Greenpeace Australia Pacific.